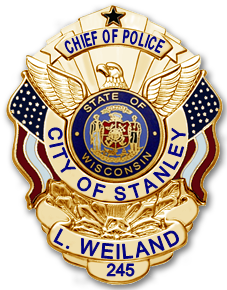 My name is Lance Weiland and I am the Police Chief for the City of Stanley. Thank you for visiting the Stanley Police Department’s website and I hope you find the information presented to be useful. With the fast paced and ever changing world we live in, I encourage you to check out our Facebook page and "like" us for the most current and relevant information related to the police department, city business and other happenings both locally and nationally. The Stanley Police Department currently has 8 dedicated employees who provide service to the city 24 hours a day, 7 days a week. We strive to provide prompt and professional service and it is my responsibility to ensure this remains a top priority. If you can’t find the information you may have been looking for on this website or if you have a suggestion regarding something we should consider adding to our site, please feel free to click on the “staff” tab and send me an email. This site will always be a work in progress so your feedback on how we can improve upon it, is always welcome. Thank you for taking the time to visit the Stanley Police Department website.